Because of the packing on linear valves or the seats on rotary valves, there is a tendency for “stick slip and overshoot” to occur. This occurs when the actuator power is increased to overcome static friction in the valve. When movement occurs, dynamic friction, which is lower, allows the valve to move more rapidly than anticipated. The resulting “stick slip” motion often results in the valve moving past the desired new set point. 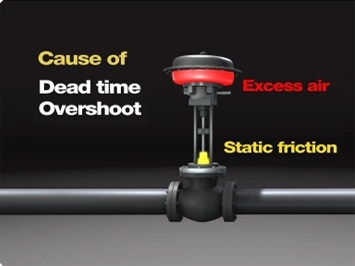 Dead time is the amount of time it takes pressure to build up within the actuator before it can overcome friction and move the valve. The dual sensor technology of the CVA delivers no over-shoot so the process variable can be maintained on spec.